It was the last day of March 2017. I—a Windows phone user and Microsoft fanboy since 2012—received an email from Wharton Brooks, whose enthusiastic CEO made some waves in August last year by claiming that his startup company was going to be “bringing new products and services that will radically change the mobile computing industry” with an upcoming line of Windows phones. Finally, after numerous delays, the design and engineering of their first phone—the Cerulean Moment—was complete. I was traveling at the time but forwarded the email to my buddy (and Apple-phile) Adam—who had already correctly predicted that there was no way this phone was going to be ready for the 2016 holidays regardless of what the CEO originally promised—for his thoughts. “Good thing they sent out the email today instead of tomorrow on April Fool’s day,” he replied. It might as well have been sent out on April 1st. The specifications were twenty yards away from cutting edge, the design was similar to an iPhone 4 (from 2010! ), and the price tag was merely reasonable. Worse, this phone was only going to come to market if it obtained crowdfunding of $1.1 million on Indiegogo.com. This phone was basically Dead On Arrival. And with it was the death knell of Windows phone. For yours truly, anyhow. Never mind that tech media had already proclaimed that “Windows phone is dead” in numerous headlines over the last two (three?) years. 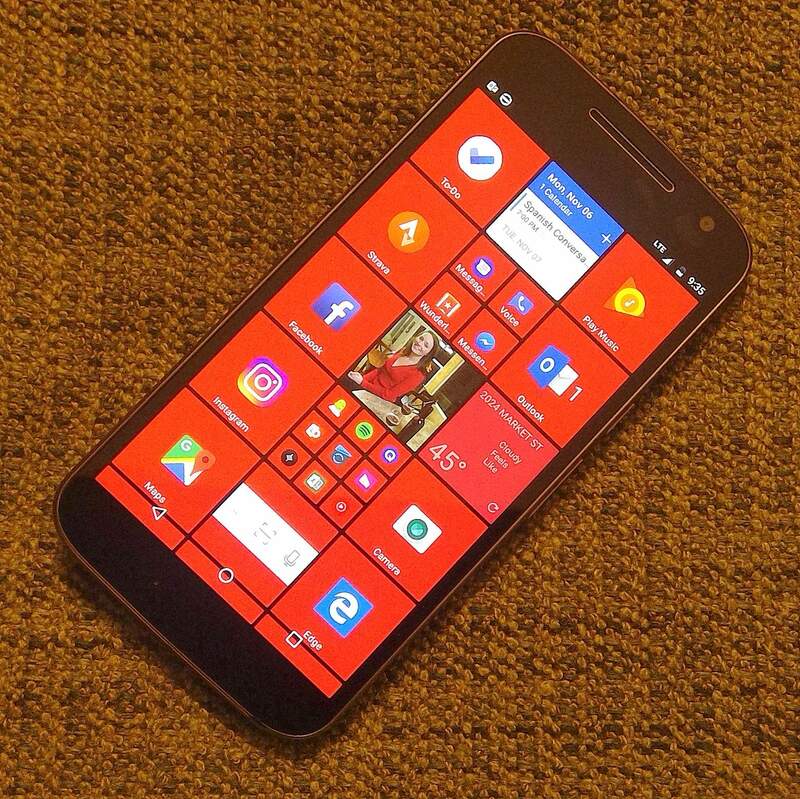 Or that the storied Lumia line of phones by Nokia/Microsoft had sung their swan song with the mid-range Lumia 650 in February 2016. 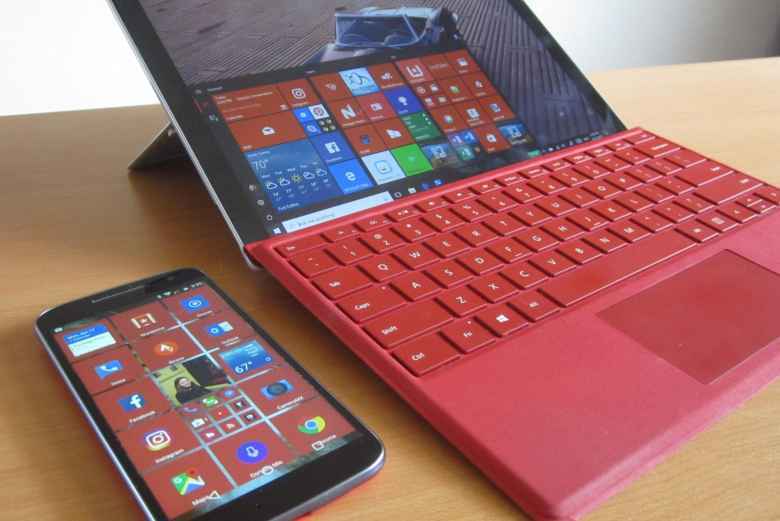 Only a few Windows 10 Mobile devices were still in production: chiefly, the 2016 HP Elite x2 and Alcatel Idol 4s. Zero new Windows phones were announced at Mobile World Congress in January 2017, despite the event in Barcelona being equivalent to Vegas’ gargantuan Interbike expo, but for mobile devices. Wharton Brooks—even with the absurdity of its claims, its bookstore-like name and no history of successfully developing any physical product—was essentially the Windows phone community’s last hope for a consumer cellular device using its favorite mobile operating system. That hope went quicker than WB’s failed crowdsourcing campaign, which raised only 3% of its funding goal. Fortunately, I had seen the writing on the wall for quite some time and already had a Plan B in place. Namely: switching to a more popular mobile operating system that retained most of the things I loved about Windows. In fact, since mid-2016, I already had a device waiting in the wings. With the demise of Windows phone, Blackberry OS, Sailfish, Mozilla OS, and all the other at-the-fringe mobile operating systems, the world was left with only two choices: Android and iOS. 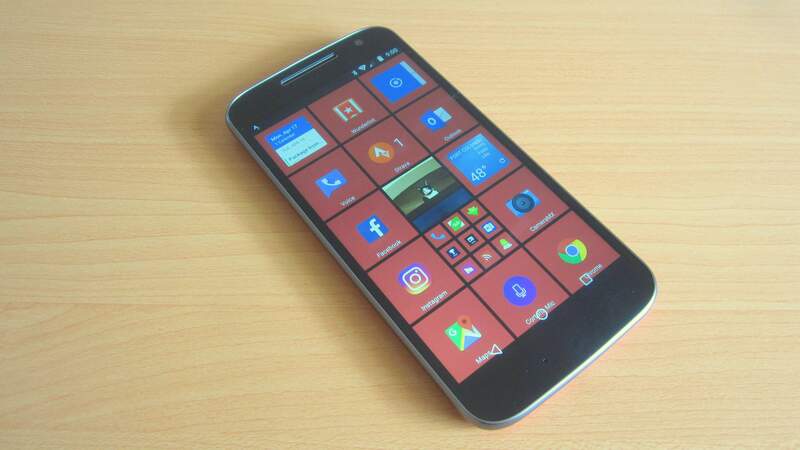 Some Windows phone fans migrated to iOS because they can’t stand Google, mainly due to all the data the Mountain View company collects from its users. Many folks were drawn to the user interface consistency of iOS apps and optimization with Apple hardware. Those are valid points to consider. Hardware choice: There are literally hundreds of different Android phones on the market today, of small to large sizes, for meager to ample budgets. Having a plethora of device options is a big reason why Windows is my preferred choice for PCs nowadays, despite owning Apple and Linux computers in the past. Innovation: Most of the new smart phone features (including, admittedly, many gimmicks) of the last few years have been brought to market first by Android manufacturers. E.g., large screen sizes, always-on displays, hand-flicking gestures, quick charging, dual cameras, squeezable frames and bezel-less displays. Lately it seems like Apple is lagging behind in everything. New Android devices hit the market every week whereas new Apple produts come out only a few times a year. There are also a few things on, say, my mom’s iPhone that threw me for a loop every time I had to service it. For example, not having a back button, not being able to drag-and-drop files between it and another computer using a USB cable, using a proprietary connector (Lightning) that none of our other devices used, and having a puny battery. It’s also a shame that as of right now (August 2017), no iPhone has rapid charging approaching Qualcomm Quick Charge 3.0 or some of the even faster proprietary fast charging technologies like OnePlus’ Dash Charge. In 2016, when I started experimenting with Android for something that could eventually become my daily driver, I was looking at devices that were relatively inexpensive (under $220) and had a fairly large screen. First, I tried a Sony Xperia Z3. I loved its design language, but was disatisfied with its battery life and charging times, so returned it. Tech sites declared its camera as best in class. It is a solid shooter, at least with good lighting, and I really like the Moto camera’s user interface, auto-HDR and manual modes. Its low-light prowess, however, is rather lacking, and I often have to resort to manual mode to get usable nighttime pictures that are not unacceptably grainy. It has a removable back cover. 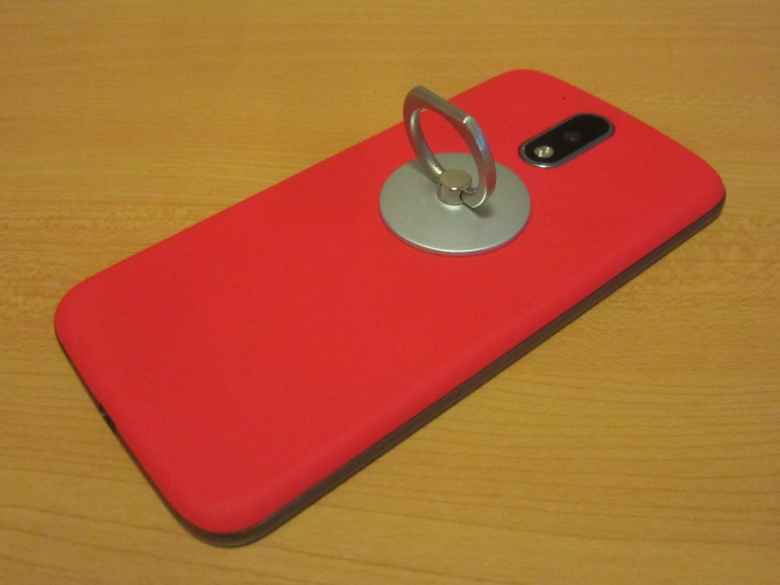 I’m not a fan of phone cases as they add thickness, and always liked back covers that you could swap out for a different color, put a magnetic plate underneath for attaching to magnetic phone mounts, and give you access to the battery. It supports fast charging—dubbed TurboPower by Motorola. In fact, it supports Qualcomm Quick Charge 3.0, even though the phone came with, essentially, a Quick Charge 2.0 charger. Qualcomm claims that a Quick Charge 3.0-enabled phone can be charged from 10% to 80% in 30 minutes, and that seems about right. Quick charging has changed how I re-juice my phone. Instead having to plug in the phone every night, I recharge the phone during short periods of the day when I am not using it (e.g., shower). The battery is reasonably large (3000 mAh) and battery life is good. I usually can make it through a whole day with plenty of battery capacity remaining, and the ability to fast charge reduces range anxiety tremendously. Motorola promised—and indeed delivered in early 2017—an OS update to Android 7.0, a.k.a. Nougat. Aesthetically, I liked how the Moto G4 was devoid of all carrier and manufacturer branding except for the Motorola bat logo in the trademark “Moto dimple” on the rear. I also liked that the frame/screen surround looked like titanium, despite being made out of plastic. While the battery is not easily removable, it is user accessible and replaceable by peeling off the back cover and loosening a bunch of screws. The screen size of 5.5″ seems to be the sweet spot for me. Motorolas come with little bloatware in comparison to other Android phones. I really like the built-in Moto gestures—particularly double twisting the phone to quick-launch the camera. The Moto G4 was recommended by virtually all the major tech websites for its price range. I could pick up an unlocked G4 at Best Buy for $200 (fall 2016—they go for a lot less now). I wouldn’t say the phone is perfect, but it is very capable as a daily driver in all respects except for low-light photography. In the future, the top features on my wish list would include dual cameras (with either a wide-angle lens or a lens for artificial bokeh; not sure what I would prefer), better low-light shooting capabilities, USB-C and at least 3 GB of RAM and 32 GB of internal storage. But the Moto G4 should get me through this year with no trouble. After settling on the Moto G4, I set out to make it as similar to a Windows phone as possible. After all, I was still a Windows phone fan who was reluctant to switch. Fortunately, nearly all the apps I used on Windows phone are on Android (and iOS). The main exceptions include Microsoft Edge, Microsoft Maps, and Microsoft Photos, but Google Chrome, Google Maps, and Google Photos serve as good replacements. The main drawback of Google’s services is that there is no synchronizing of data with Microsoft’s services, including bookmarks, browser history, and maps. One of the main draws of Windows phone was the dynamic Live Tiles that flip to display notifications. To my eye, they are much better looking and more interesting than the sea of static icons that dominate the screens of most Android and iOS devices. Functionally, Live Tiles behave like Android widgets, but have a more consistent, modern appearance and draw less power. Fortunately, there are Android launchers that mimic the look of Windows Phone 8 or Windows 10 Mobile very closely. The launcher I am using is SquareHome 2, which is entirely free (except for advanced functions I do not need), robust, and highly configurable. Far more configurable: You can change the color and transparency of any tile. There are more available sizes. You can also change the icon and text sizes on the tiles. More robust: Sometimes live tiles on Windows 10 Mobile for, say, Outlook would not clear the unread message count after messages were read. In contrast, I’ve never had such issue with SquareHome 2. Also, with SquareHome 2, swiping away notifications in the notification tray clears the tile too—something that did not happen on Windows phones. You can turn off individual live tiles: Unlike on Windows 10 for PC, you could never turn off live tiles on Windows phones. There are apps (like news) I do not want flashing distracting notifications, so it is nice that you can turn off notifications on any tile in SquareHome 2. SquareHome 2 does require a lot more time to set up than the authentic Live Tiles in Windows. Also, as close as SquareHome 2 gets to the look of genuine Windows, some tiles will look worse—especially if you have to embed an Android widget on the tile to get the same functionality as a genuine Windows tile. But for me, SquareHome 2 looks both good and close enough to Windows phone that I really enjoy using it. Now that it has entirely conceded the mobile phone market, Microsoft should really consider making an official launcher like SquareHome 2 instead of, or in addition to, their Arrow launcher for Android. Many former Windows phone enthusiasts like myself would adopt it! The first thing I did when I got the G4 was order an OEM back cover in red to match my Surface Pro 4. I found one for a few dollars on eBay. I also added a ring stand. This brilliant mechanism serves multiple purposes: it allows you to hold or carry your phone one handed without fear of dropping it due to butterfingers (I slip the ring onto my index or middle finger), and it acts as a robust kickstand that you can use to prop up the phone in either landscape or portrait mode. It looks far more elegant than the über-popular PopSockets that a climbing partner of one of my best friends invented and sold millions of. Most ring stands have a square or rectangular base, but the round ones look better to my eye. After these modifications, the Moto G4 looks like a good companion to the Surface Pro 4, yes? 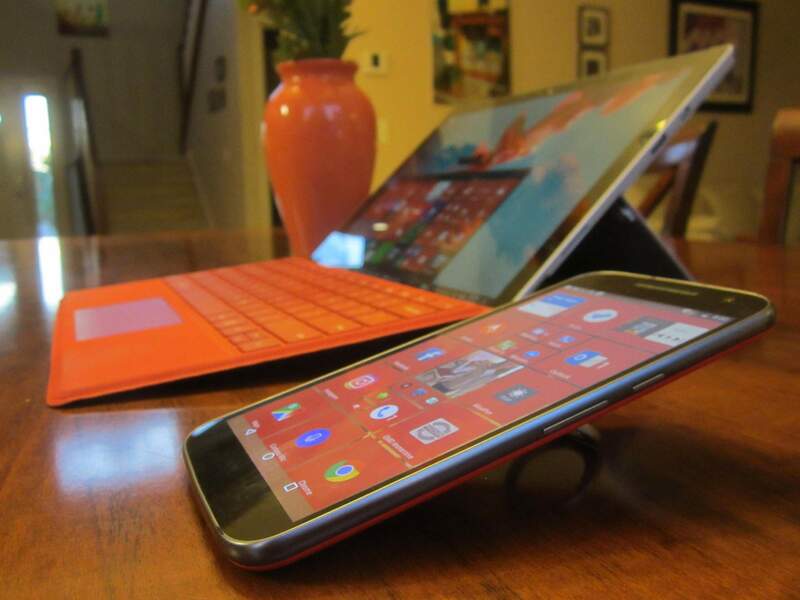 It certainly matches the SP4 better than the Lumia 640 XL did. When I first adopted Windows phone, it had a few key advantages over Android and iOS. HERE Maps—then exclusive to Nokia Lumias—had downloadable offline maps that turned the phone into a standalone GPS device long before Google Maps had that functionality. It was invaluable during my 2013 Europe trip. Microsoft Office for Mobile was another Windows phone exclusive. So were hubs (the aggregation of data from third parties like Facebook), Kid’s Corner, large and beautiful typeface dubbed “Metro,” and, of course, Live Tiles. The flagship Lumia phones also took the best photos. All those advantages are gone. There are still a few things Windows phones have a leg up on Android as listed below, but only slightly. Meanwhile, Android has significant advantages in many areas. The list includes apps and features a Microsoft fan may typically use. Live Tiles Built into OS and ready to go. Free SquareHome 2 app is way more configurable than W10M live tiles; see section above. Clearing the notifications clear the live tiles. Blue light elimination mode Filtering blue light at night helps people sleep better. Can install Twilight on Android. No similar app exists for W10M, but a Night Light feature is supposed to come to W10M in a future update (it is already available for W10 desktop). Web browser Microsoft Edge allows you to swipe pages back and forward. (On Android, use back and forward buttons instead). Syncs with Edge on PC. No Chrome available on W10M to sync with PC. Many people prefer Chrome on PC due to more extensions and other features. Groove Can load songs from external SD card. (Mitigation on Android: use adoptable storage with a fast SD card in Nougat, as Groove can’t use external storage. Or not a problem if you have enough internal storage as many Android devices do now.) Can download all songs easily for playback, or copy onto SD card/phone. (Android: have to download albums one by one.) Can swipe to next song. (Android: press arrow instead.) Shows album art on lock screen reliably on Android (not reliable on W10M). Have option of using Google Music instead which is works better on Android than Groove and works with Chromecast. OneDrive Better integration with OS and the Photos app. OneDrive is much more robust on Android. OneDrive often crashes in Windows 10 Mobile. On Android, photos seem to auto-upload more quickly and reliably. File System W10M’s file system is much easier to understand. For example, photos are stored in a folder called Photos while Android’s are stored in a folder named DCIM. Android also lists many system directories that add clutter and confusion. Messaging in the car When text messages come in while using Bluetooth or AUX (such as while driving), W10M will read them out loud to you. (Mitigation on Android: say “OK Google… read me my last text message.”) For some people, not auto-reading text messages is preferable so that there are less distractions while driving and more privacy. Outlook Uses extra screen real estate in landscape. (No way to have dual panels in Android.) Can pin Calendar and Contacts icon to home screen. (Mitigation on Android: pin Outlook Calendar Widget to home screen instead. Access Contacts by launching Outlook.) Can add or edit Outlook contacts and recurring events. (Mitigation on Android: use web app instead to add or edit.) Allows you to set the time period for an appointment by dragging a bar. (W10M: select hours and minutes—a little more tedious.) Appointment location field auto-suggests addresses upon typing in place. (W10M: look up manually yourself.) Some HTML emails display better in Outlook for Android than Outlook for Windows 10 Mobile. Office Lens Equal Equal, now that it can create multiple-page PDFs starting August 2017. Maps Google Maps is better at showing traffic and rerouting. It can also show your location to other people for indefinite amounts of time. Keyboard Microsoft keyboard has a software “pointing stick” similar to those on Thinkpads. (Mitigation on Android: get used to using finger slider, or display arrow keys in Swiftkey.) Can capitalize letters by double-tapping and then pressing shift button. (Android: delete letter and replace with capital letter.) (Microsoft-owned) Swiftkey allows for typing in different languages without switching keyboards. Has a clipboard history. Swiftkey is much more configurable to show numbers row and symbols so you don’t need to keep switching keyboard screens. Swiftkey’s predictive text is faster and better. Google voice assistant suggests words to correct transcriptions. YouTube MyTube has no ads and allows you to play videos at a faster or slower speed. (Mitigation on Android: pay for YouTube Red for no ads, or live with them. Install and “share” videos to BSPlayer app for playing at faster or slower speeds; very easy to do.) Has official YouTube app, which sometimes seems more robust than MyTube in playing back videos without stuttering. Kindle Does not cut off parts of page, unlike Kindle App for W10M. Estimates time left in chapter. Much easier to log in. Camera Live photo functionality. (Mitigation on Android: install Camera MX to create GIFs and looping videos instead that are like the live photo effect, but not as good.) Mode for High Dynamic Range is much more robust and quicker. Many Android phones have auto-HDR. Love being able to activate camera on Moto G4 by twisting the wrist twice or pushing the power button twice. (W10M: press-hold camera button on lock screen.) Can use the volume key as a camera shutter. Gestures Many Windows phones support automatically putting the call on speaker phone if the phone is not against your ear. (Mitigation on Android: press speaker phone button instead.) Some Android phones have exclusive gestures that are very handy. Motorola, for example, has double-twist to launch camera, and “chop-chop” to activate flashlight. Wi-fi Gives you the option of automatically turning wi-fi back on after an hour or so. Switching apps Task-switching button on Android is much quicker than holding down the back button on Windows phone. Can show two apps at a time with split-window in Android Nougat. Also can immediately switch to last app by double-tapping the button in Nougat. Tethering* Carriers support tethering on Android phones much more than on Windows phone. And if carrier doesn’t offer tethering, you can install PDAnet (free) for occasional tethering. Voicemail Has visual voicemail apps that are often lacking on Windows phone. Projecting to monitor/TV Chromecast is better than Microsoft Display Adapter, which often results in stuttering and is not as easy to use. Hardware choice* Much wider choice of phones, from budget to cutting edge. No one makes Windows phones using the latest (2017) available chips anymore. There are only three or four Windows phones with fast-charging, and none with dual cameras. Other third-party apps* Has way more apps. Almost no one is developing for W10M anymore. Security W10M has much less malware than Android. Microsoft collects far less information than Google. Many Android phones have a fingerprint scanner. Almost no Windows phone does. Updates W10M gets much more frequent updates especially if you sign up for the Insiders program. Android suffers from fragmentation and updates are slow to come to some phones, if at all. In summary, most of the Microsoft apps still work slightly better on Windows 10 Mobile. But they still work very well on Android for the most part. For all other apps, there is virtually no comparison—they work better on Android, even if they are available for Windows 10 Mobile. There was an adjustment period in which I still prefered Windows 10 Mobile for many of the reasons listed in the chart above. I really love fast charging, which only a few high-end Windows phones (and even no iPhone) can match. I can now use Chromecast with my phone. I previously used an xBox 360, Microsoft Adapter, or Lenovo PC adapter as a TV media streaming device, and Chromecast is far easier, quicker, and intuitive. My Garmin Forerunner 35 (what I replaced the Microsoft Band 2 with due to it splitting) synchronizes much more reliably with Android than Windows phone, particularly notifications. The sheer number of quality device options in the Android world is mindblowing. Maybe that is not a good thing for folks who get overwhelmed by options, by I sure appreciate having compelling hardware choices from Asus, Honor, Huawei, HTC, LG, Motorola, Nokia, OnePlus, Samsung, Sony, ZTE, and dozens more. My pre-paid carrier, Cricket, does not offer tethering with the Moto G4 (or almost any Windows phone, for that matter). But I can connect to the internet on the Surface Pro 4 through my Moto G4 via the free PDAnet app (installed on both cell phone and SP4) and bluetooth in a pinch. So for the first time in my life, I have tethering. Having supplanted the Microsoft Band 2, xBox 360, and Lumia 640 XL with a Garmin Forerunner 35, Chromecast, and Moto G4 this year probably indicates that my fanaticism for Microsoft hardware is over. I still have—and really like—a Surface Pro 4, along with a Microsoft keyboard and mouse for my desktop workstation computer. But my future replacement for the SP4 will probably not be Microsoft branded considering how unrepairable and expensive Surface products are (score of 1/10 by iFixIt.com for something as basic as replacing an inevitably degrading battery). Manufacturers such as HP and Dell have also really stepped up their game, so Microsoft is not the only PC company that makes drool-worthy alternatives to Apple products. I’m still a big fan of Microsoft software (except for the mess that is Skype). Not only are their core products ubiquitous and available for all platforms, but the company has gone a long way to make sure that, for example, Androids and iPhones work well with Windows 10 PCs. For example, PCs receive timely smartphone notifications, and it’s really easy to resume working on an Office document on smartphone or computer. But even on the software front, I am starting to diversify a bit. I now rent streaming movies on YouTube instead of from the Windows Store, and use Google Play Music instead of Microsoft Groove on the Moto. One day I might even migrate photos to Google Photos as Adam did. I’m happy with storing photos on OneDrive, but Google Photos’ Android integration, free unlimited cloud storage, and face recognition capabilities are enticing. That’s another good thing about switching over to Android for smartphone: I have my feet in the world’s two most ubiquitous operating systems for mobile and for PC now. I can reap the benefits of both. 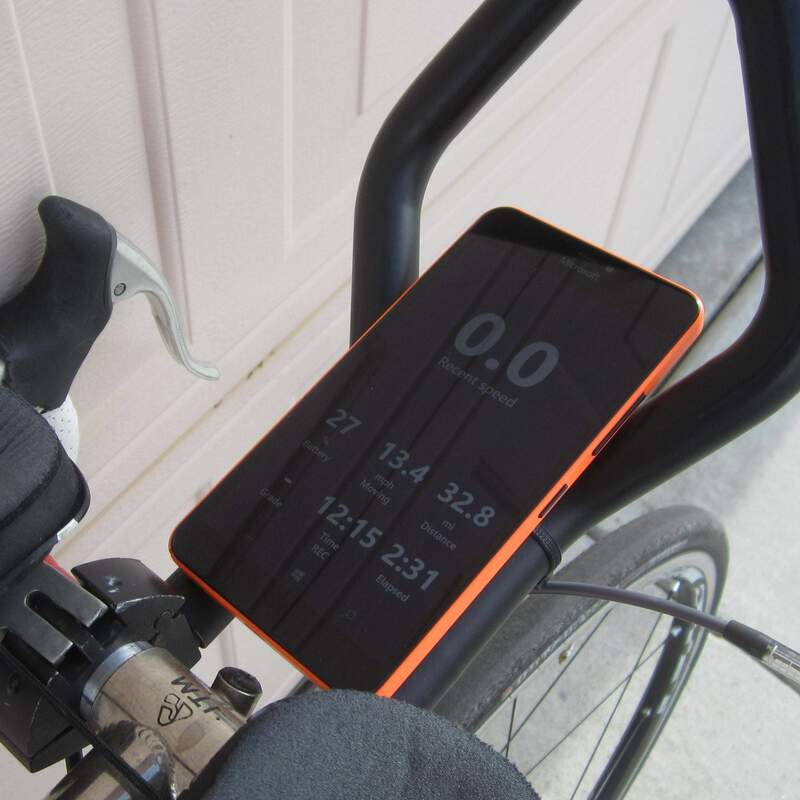 The Lumia 640 XL primarily serves as a backup phone and bicycle computer nowadays, using the Cycle Tracks app. Here’s an updated photo from November 6, 2017. I still love the SquareHome 2 launcher. I’m also really enjoying using Microsoft Edge for Android now too.